Over the years, my painting practice has become more and more refined. 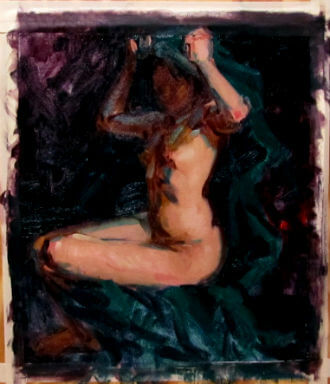 I always begin with sketches from memory followed by several sessions from life working with a model to achieve the subtlety and feeling I am after. I then begin to re-express the image with color before I venture into the larger, final image. This is a very important step. In a sense, I am setting the stage for my character- the lighting, the mood, for the performance. Color is critical. Color provides the emotional key. It acts immediately upon the viewer almost prior to his very recognition of the forms presented. This re-expression of the image through color- the key– takes different forms. In most cases, I construct the image as I imagine it, including the color. I then look to several color combinations called chords and re-develop the image “color key” depending on which combinations I feel are most evocative and carry the emotional tenor I am after. At this stage, I lay the colors on my palette and work the possible combinations. My primary concern being, can I achieve the realism I am after along with a heightened sense of emotion? Can I achieve the lights and shadows, the cools and warms as I see them along with the temperature variance in the flesh tones? I am looking for the most dynamic color combinations that can coexist, providing an inherent unity as well as fluidity throughout the image. I want the paint itself to be beautiful-the color to be full and lush. Paint must describe the form but it must also have its own beauty and sensuality- its very materiality touches us in a sensate way. Color must exist in a duality-expressed as pure paint as well as a description of form. So the color must be beautiful in itself, impressive to behold. Sometimes there are two chord combinations that are very close. And either chord would work effectively. At this stage, I take each combination and proceed to paint a study from life. It is only by working from life that one can examine those subtle shades of indescribable colors and how to achieve them. And in almost all cases the dominate chord will become self-evident. In the end, I chose the complement combination of Red set against Green, bordered by its near neighbors because the darks held together in such a way as to allow the lights of yellow-green and red to feel luminous. I have included both combinations so that the reader could conduct their own experiment and see the variance between the chord and the complement combinations. One can only really get a feeling for color through mixing on the palette in a tactile way.